Could we see Spider-Man duking it out against Tom Hardy's Venom in the future? Director Ruben Fleischer certainly isn't ruling out the possibility. 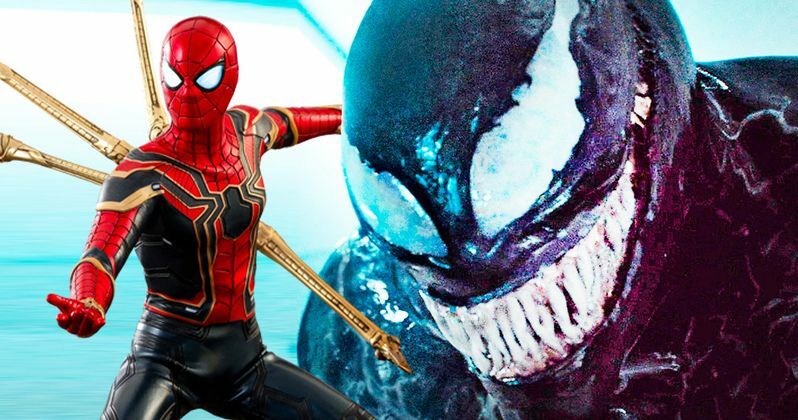 During Sony's San Diego Comic-Con presentation for the upcoming Venom movie, the filmmaker teased that the door is open for that in the future and that he would very much like to see it happen. But that may not be as easy as it sounds. Sony cut a deal with Marvel Studios a few years back to allow for Spider-Man to appear in the Marvel Cinematic Universe. Sony still owns the character rights, but Marvel Studios is allowed to use them. However, Sony still has lots of other characters from that universe that they can put to use, which is exactly what they're trying to do with Venom, the first in a planned universe of spin-off movies. There also have movies like Morbius, Nightwatch, Silk and Silver and Black in development. Originally, Sony's Amy Pascal indicated that these new movies will take place in the same universe as the MCU. That has since been shut down by Kevin Feige and Marvel. However, at SDCC, Ruben Fleischer decided to fan the flames a bit for those that hope Tom Holland may meet up with Tom Hardy on screen someday. Here's what Fleischer had to say. "I think we can all agree it would be pretty amazing to see Spider-Man and Venom face off in a film. I have to think that the studio is thinking the same way and at some point down the road they're gonna run across each other's paths." Tom Hardy, who was also at the panel for the exciting Venom Comic-Con footage, said that would like to go toe-to-toe with Tom Holland someday. Fleischer responded to that with, "I can't wait for it." There were rumors floating around that Holland was possibly going to make a cameo in Venom. Those rumors were never confirmed but it seems unlikely to be happening and Venom seems like it definitely won't share any sort of crossover with the MCU, which lines up with what we've heard previously from the powers that be. So, despite the fact that those involved with the spin-off want to see it happen, it could just be a pipedream. For now. Ruben Fleischer chose his words carefully. Certainly, the studio, in this case Sony, is thinking that they would like to see something like that happen. It would be good for business. But Marvel Studios isn't going to risk damaging their brand. The only way they would even consider something along these lines is if Venom, which arrives in theaters on October 5, comes out and crushes it with critics and at the box office. Then maybe, only maybe, will that door actually swing open. But the willingness and desire exists. And strangers things have happened. After all, it wasn't that long ago we thought Spidey would never be in an Avengers movie. Yet, here we are. This news comes to us courtesy of Comicbook.com.